The UW Health Pediatric Neurosurgery program provides care for children with hydrocephalus. Hydrocephalus, which is translated as "water on the brain," is an abnormal amount of cerebrospinal fluid in the brain. The increased fluid causes intercranial pressure, which can result in the symptoms listed below. When functioning properly, cerebrospinal fluid cushions brain tissue from trauma and delivers nutrients to the brain, then exits the brain and is reabsorbed by the bloodstream. Hydrocephalus results when this equilibrium is disturbed. Though the exact number of children with hydrocephalus is not known, experts estimate that one in 500 children suffers from the disease. The shunt diverts cerebrospinal fluid to the abdomen. Hydrocephalus can be congenital (passed on via the child's genes) or acquired (developed at or after birth). The causes are not fully understood, but acquired (non-congenital) hydrocephalus may result from problems associated with premature birth, head injuries and tumors. Hydrocephalus often requires the surgical placement of a shunt to divert excess fluid from the brain and relieve intracranial pressure. 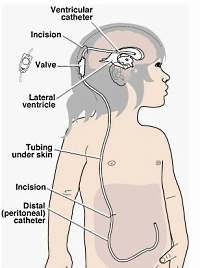 The shunt, a narrow tube placed in the brain ventricle, reroutes cerebrospinal fluid to the abdomen. This allows the cerebrospinal fluid to be absorbed back into the bloodstream which is the body’s normal process.